Heinz Chapel is non-denominational and has 73-foot high stained glass windows. I loved my visit to the University of Pittsburgh!! The 132-acre campus is right in the middle of the Oakland community of Pittsburgh, considered the educational and cultural center of the city. 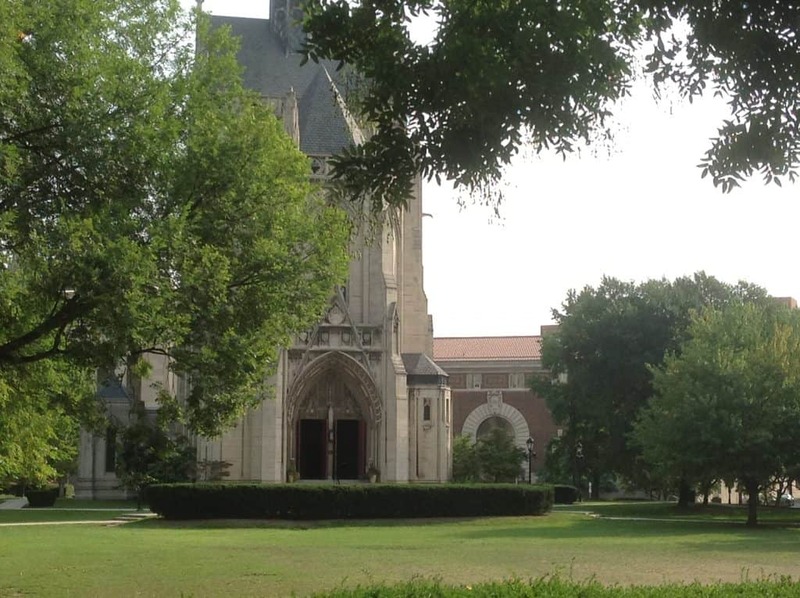 There are four colleges in the immediate area, contributing to the feel of a college town, and the 456-acre Schenley Park, the fourth-largest inner city park on the eastern seaboard, is adjacent to the campus. Pitt has about 17,000 undergraduates and another 12,000 graduate students. students enter one of the four Undergraduate colleges: engineering, business, arts and sciences (the largest) or nursing, and can matriculate to upper division programs in education, health sciences, social work and information sciences. Different schools have different general ed requirements, which will generally require students to take courses within different disciplines. Engineering students are required to take a freshman seminar in which they learn about the different engineering specialties, to help them make their major decision. Half of the engineers participate in Pitt’s co-op program, which allows engineering students to take a semester off of school to take a full-time paid job. Pitt is also one of the only colleges that offers a bachelor’s degree in neuroscience. About 55% of students live on campus, and housing is guaranteed through the junior year. Most freshmen live in the Litchfield Towers, mostly doubles and some singles. Every dormitory at Pitt requires students to show an ID to an on-duty security officer, who must buzz them inside. The student-to-faculty ratio at Pitt is 14:1, and only 6% of the 2200 classes offered each semester have over 100 students. 40% of the classes have fewer than 30 students. 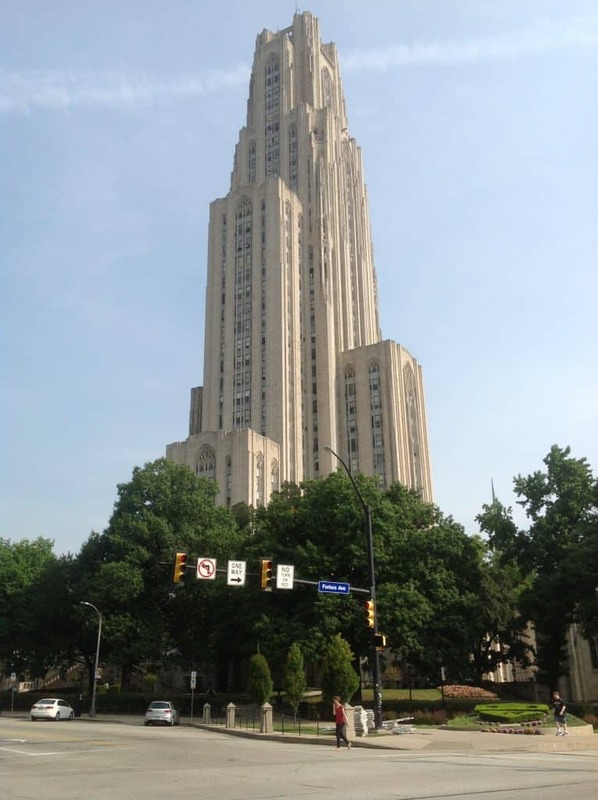 The Cathedral of Learning is the 4th tallest academic building in the world, at 42 stories. My tour guide was Scott, a senior English literature major from Baltimore. He had been president of his fraternity his junior year and was active in an a cappella singing group. He told us that “not a lot of students here are bookworms,” and said that a key to enjoying your time at Pitt is getting involved in one of the many student groups. About 63% of the students at Pitt are Pennsylvanians, and about 17% of students study abroad at some point during their time here. The Honors College is a degree-granting college that offers a Bachelor of Philosophy; students seeking this degree must write and defend a thesis. Pitt’s quarter-mile square campus has a busy vibe, and students frequently say that they cannot walk across campus (an 8-10 minute walk) without passing someone they know. The upper campus, known as “The Hill,” feels very much like a college town. School spirit is high; Pitt is a member of the Atlantic Coast Conference and the Panther football team plays in the same stadium as the Pittsburgh Steelers. You can see all of my photos from my visit to Pitt here.